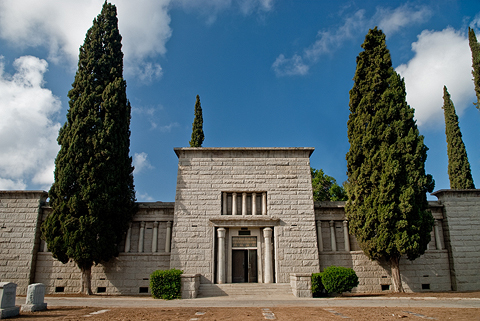 The Riverside Mausoleum, built in 1914, was designed by architect Henry Jekel for the California Mausoleum Company. Evergreen Cemetery acquired the building in 1925. Later on, Jekel would design the crematory addition to the mausoleum (1929) and the cemetery office building (early 1940s). The only two buildings Jekel did not design were the receiving vault and the modern mausoleum. Jekel was known for his work in the Spanish-Moorish tradition, designing skyscrapers in Washington, D.C. and Philadelphia before coming to California. Working in Riverside from 1925 to 1940 he designed a number of homes and public buildings including Benedict’s Castle (Castillo Isabella). 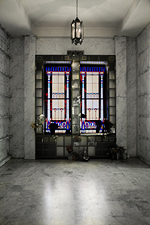 A report on the history of Evergreen Cemetery entitled “At the Foot of the Mount,” by Lee August Simpson and Chuck Wilson, provides a good description of Jekel’s work on the mausoleum and his departure from his normal style to focus on Egyptian motifs. “Constructed with a strong Egyptian influence, the mausoleum mirrors the cut stone masonry style of architecture initiated by Imhotep of ancient Egypt. It was Imhotep who is credited with designing the funerary district around the pyramid of Zoser. The papyrus motif of the Riverside mausoleum is linked with lower Egypt and is of the same type used in the North Palace of King Zoser. “Architect Henry Jekel, who designed the Riverside mausoleum, sought to create a rustic atmosphere that echoed Imhotep’s work by using granite blocks that became smaller in size with each succeeding row. The heavy rough hewn battered granite walls and essentially rectangular groundplan is also reminiscent of 4th Dynasty mastabas, crypts for high officials and members of the Egyptian royal family. “Mausoleum columns also follow Egyptian construction techniques. Although Imhotep used more enduring construction materials than his predecessors, he sought to create the look of wood, mud, and reeds in his columns. To this end, the mausoleum’s columns resemble bundles of papyrus. The Egyptians also used ‘engaged’ or joined columns. The columns of the mausoleum in the eastern and western facade bays are an example of this style. Only those in the central bay are free-standing. 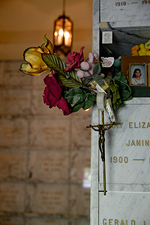 The Riverside Mausoleum contains 425 crypts and 300 niches and was designated a cultural heritage landmark by the City in 1985.